In astrophysics and cosmology, dark matter is a major component of the universe of unknown composition that does not emit or reflect electromagnetic radiation. Although it cannot be observed directly, its presence can be inferred from gravitational effects on visible matter. According to present observations of structures larger than galaxies, as well as Big Bang cosmology, dark matter accounts for the vast majority of mass in the observable universe. The observed phenomena consistent with dark matter observations include the rotational speeds of galaxies, orbital velocities of galaxies in clusters, gravitational lensing of background objects by galaxy clusters such as the Bullet cluster, and the temperature distribution of hot gas in galaxies and clusters of galaxies. Dark matter also plays a central role in structure formation and galaxy evolution, and has measurable effects on the anisotropy of the cosmic microwave background. All these lines of evidence suggest that galaxies, clusters of galaxies, and the universe as a whole contain far more matter than that which interacts with electromagnetic radiation: the remainder is called the "dark matter component." The composition of dark matter is unknown, but may include ordinary and heavy neutrinos, recently postulated elementary particles such as WIMPs and axions, astronomical bodies such as dwarf stars and planets (collectively called MACHOs), and clouds of nonluminous gas. Current evidence favors models in which the primary component of dark matter is new elementary particles, collectively called non-baryonic dark matter. The dark matter component has vastly more mass than the "visible" component of the universe. At present, the density of ordinary baryons and radiation in the universe is estimated to be equivalent to about one hydrogen atom per cubic meter of space. Only about 4 percent of the total energy density in the universe (as inferred from gravitational effects) can be seen directly. 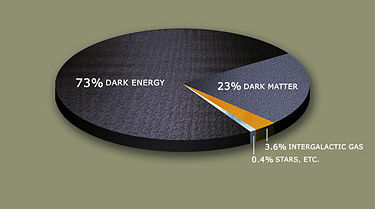 About 22 percent is thought to be composed of dark matter. The remaining 74 percent is thought to consist of dark energy, an even stranger component, distributed diffusely in space. Some hard-to-detect baryonic matter makes a contribution to dark matter, but constitutes only a small portion. Determining the nature of this missing mass is one of the most important problems in modern cosmology and particle physics. It has been noted that the names "dark matter" and "dark energy" serve mainly as expressions of our ignorance, much as the marking of early maps with "terra incognita". The first to provide evidence and infer the existence of a phenomenon that has come to be called "dark matter" was Swiss astrophysicist Fritz Zwicky, of the California Institute of Technology (Caltech) in 1933. He applied the virial theorem to the Coma cluster of galaxies and obtained evidence of unseen mass. Zwicky estimated the cluster's total mass based on the motions of galaxies near its edge. When he compared this mass estimate to one based on the number of galaxies and total brightness of the cluster, he found that there was about 400 times more mass than expected. The gravity of the visible galaxies in the cluster would be far too small for such fast orbits, so something extra was required. This is known as the "missing mass problem." Based on these conclusions, Zwicky inferred that there must be some non-visible form of matter which would provide enough of the mass and gravity to hold the cluster together. Composite image of the Bullet cluster shows distribution of ordinary matter, inferred from X-ray emissions, in red, and total mass, inferred from gravitational lensing, in blue. Much of the evidence for dark matter comes from the study of the motions of galaxies. Many of these appear to be fairly uniform, so by the virial theorem the total kinetic energy should be half the total gravitational binding energy of the galaxies. Experimentally, however, the total kinetic energy is found to be much greater: in particular, assuming the gravitational mass is due to only the visible matter of the galaxy, stars far from the center of galaxies have much higher velocities than predicted by the virial theorem. Galactic rotation curves, which illustrate the velocity of rotation versus the distance from the galactic center, cannot be explained by only the visible matter. Assuming that the visible material makes up only a small part of the cluster is the most straightforward way of accounting for this. Galaxies show signs of being composed largely of a roughly spherically symmetric, centrally concentrated halo of dark matter with the visible matter concentrated in a disc at the center. Low surface brightness dwarf galaxies are important sources of information for studying dark matter, as they have an uncommonly low ratio of visible matter to dark matter, and have few bright stars at the center which impair observations of the rotation curve of outlying stars. According to results published in August 2006, dark matter has been observed separate from ordinary matter through measurements of the Bullet Cluster, actually two nearby clusters of galaxies that collided about 150 million years ago. Researchers analyzed the effects of gravitational lensing to determine total mass distribution in the pair and compared that to X-ray maps of hot gases, thought to constitute the large majority of ordinary matter in the clusters. The hot gases interacted during the collision and remain closer to the center. The individual galaxies and the dark matter did not interact and are farther from the center. For nearly 40 years after Zwicky's initial observations, no other corroborating observations indicated that the mass to light ratio was anything other than unity (a high mass-to-light ratio indicates the presence of dark matter). Then, in the late 1960s and early 1970s, Vera Rubin, a young astronomer at the Department of Terrestrial Magnetism at the Carnegie Institution of Washington presented findings based on a new sensitive spectrograph that could measure the velocity curve of edge-on spiral galaxies to a greater degree of accuracy than had ever before been achieved. Together with fellow staff-member Kent Ford, Rubin announced at a 1975 meeting of the American Astronomical Society the astonishing discovery that most stars in spiral galaxies orbit at roughly the same speed, which implied that their mass densities were uniform well beyond the locations with most of the stars (the galactic bulge). This result suggests that either Newtonian gravity does not apply universally or that, conservatively, upwards of 50 percent of the mass of galaxies was contained in the relatively dark galactic halo. Met with skepticism, Rubin insisted that the observations were correct. Eventually other astronomers began to corroborate her work and it soon became well-established that most galaxies were in fact dominated by "dark matter"; exceptions appeared to be galaxies with mass-to-light ratios close to that of stars. Subsequent to this, numerous observations have been made that do indicate the presence of dark matter in various parts of the cosmos. Together with Rubin's findings for spiral galaxies and Zwicky's work on galaxy clusters, the observational evidence for dark matter has been collecting over the decades to the point that today most astrophysicists accept its existence. As a unifying concept, dark matter is one of the dominant features considered in the analysis of structures on the order of galactic scale and larger. Rubin's pioneering work has stood the test of time. Measurements of velocity curves in spiral galaxies were soon followed up with velocity dispersions of elliptical galaxies. While sometimes appearing with lower mass-to-light ratios, measurements of ellipticals still indicate a relatively high dark matter content. Likewise, measurements of the diffuse interstellar gas found at the edge of galaxies indicate not only dark matter distributions that extend beyond the visible limit of the galaxies, but also that the galaxies are virialized up to ten times their visible radii. This has the effect of pushing up the dark matter as a fraction of the total amount of gravitating matter from 50 percent measured by Rubin to the now accepted value of nearly 95 percent. Recently (2005), astronomers from Cardiff University claim to have discovered a galaxy made almost entirely of dark matter, 50 million light years away in the Virgo Cluster, which was named VIRGOHI21. Unusually, VIRGOHI21 does not appear to contain any visible stars: it was seen with radio frequency observations of hydrogen. Based on rotation profiles, the scientists estimate that this object contains approximately 1000 times more dark matter than hydrogen and has a total mass of about 1/10th that of the Milky Way Galaxy we live in. For comparison, the Milky Way is believed to have roughly 10 times as much dark matter as ordinary matter. Models of the Big Bang and structure formation have suggested that such dark galaxies should be very common in the universe, but none have previously been detected. If the existence of this dark galaxy is confirmed, it provides strong evidence for the theory of galaxy formation and poses problems for alternative explanations of dark matter. 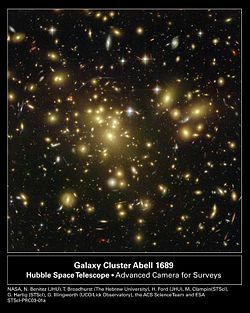 The galaxy cluster Abell 2029 is composed of thousands of galaxies enveloped in a cloud of hot gas, and an amount of dark matter equivalent to more than 1014 Suns. At the center of this cluster is an enormous, elliptically-shaped galaxy that is thought to have been formed from the mergers of many smaller galaxies. The measured orbital velocities of galaxies within galactic clusters have been found to be consistent with dark matter observations. Perhaps more convincing, a technique has been developed over the last ten years called weak lensing which looks at microscale distortions of galaxies observed in vast galaxy surveys due to foreground objects through statistical analyses. By examining the shear deformation of the adjacent background galaxies, astrophysicists can characterize the mean distribution of dark matter by statistical means and have found mass-to-light ratios that correspond to dark matter densities predicted by other large-scale structure measurements. The correspondence of the two gravitational lens techniques to other dark matter measurements has convinced almost all astrophysicists that dark matter actually exists as a major component of the universe's composition. Dark matter is crucial to the Big Bang model of cosmology as a component which corresponds directly to measurements of the parameters associated with Friedmann cosmology solutions to general relativity. In particular, measurements of the cosmic microwave background anisotropies correspond to a cosmology where much of the matter interacts with photons more weakly than the known forces that couple light interactions to baryonic matter. Likewise, a significant amount of non-baryonic, cold matter is necessary to explain the large-scale structure of the universe. Although dark matter was detected by its gravitational lensing in August 2006, many aspects of dark matter remain speculative. The DAMA/NaI experiment has claimed to directly detect dark matter passing through the Earth, though most scientists remain skeptical since negative results of other experiments are (almost) incompatible with the DAMA results if dark matter consists of neutralinos. Data from a number of lines of evidence, including galaxy rotation curves, gravitational lensing, structure formation, and the fraction of baryons in clusters and the cluster abundance combined with independent evidence for the baryon density, indicate that 85-90 percent of the mass in the universe does not interact with the electromagnetic force. This "dark matter" is evident through its gravitational effect. Several categories of dark matter have been postulated. Baryonic dark matter One candidate for missing dark baryonic matter is Rydberg matter, which has spectroscopic signatures in agreement with the unidentified infrared bands. The Concordance Model requires that, to explain structure in the universe, it is necessary to invoke cold (non-relativistic) dark matter. Large masses, like galaxy-sized black holes can be ruled out on the basis of gravitational lensing data. Possibilities involving normal baryonic matter include brown dwarfs or perhaps small, dense chunks of heavy elements; such objects are known as massive compact halo objects, or "MACHOs." However, studies of big bang nucleosynthesis have convinced most scientists that baryonic matter such as MACHOs cannot be more than a small fraction of the total dark matter. At present, the most common view is that dark matter is primarily non-baryonic, made of one or more elementary particles other than the usual electrons, protons, neutrons, and known neutrinos. The most commonly proposed particles are axions, sterile neutrinos, and WIMPs (Weakly Interacting Massive Particles, including neutralinos). None of these are part of the standard model of particle physics, but they can arise in extensions to the standard model. Many supersymmetric models naturally give rise to stable WIMPs in the form of neutralinos. Heavy, sterile neutrinos exist in extensions to the standard model that explain the small neutrino mass through the seesaw mechanism. Experimental searches for these dark matter candidates have been conducted and are ongoing. These efforts can be divided into two broad classes: direct detection, in which the dark matter particles are observed in a detector; and indirect detection, which looks for the products of dark matter annihilations. Dark matter detection experiments have ruled out some WIMP and axion models. There are also several experiments claiming positive evidence for dark matter detection, such as DAMA/NaI and EGRET, but these are so far unconfirmed and difficult to reconcile with the negative results of other experiments. Several searches for dark matter are currently underway, including the Cryogenic Dark Matter Search in the Soudan mine and the XENON experiment at Gran Sasso, and many new technologies are under development, such as the ArDM experiment. In research due to be fully published in spring 2006, researchers from the University of Cambridge Institute of Astronomy claim to have calculated that dark matter only comes in clumps larger than about 1,000 light-years across, implying an average speed of dark matter particles of 9 km/s, a density of 20 amu/cm³, and temperature of 10,000 kelvins. A proposed alternative to physical dark matter particles has been to suppose that the observed inconsistencies are due to an incomplete understanding of gravitation. To explain the observations, the gravitational force has to become stronger than the Newtonian approximation at great distances or in weak fields. One of the proposed models is Modified Newtonian Dynamics (MOND), which corrects Newton's laws at small acceleration. However, constructing a relativistic MOND theory has been troublesome, and it is not clear how the theory can be reconciled with gravitational lensing measurements of the deflection of light around galaxies. The leading relativistic MOND theory, proposed by Jacob Bekenstein in 2004 is called TeVeS for Tensor-Vector-Scalar and solves many of the problems of earlier attempts. However, a study in August 2006 reported an observation of a pair of colliding galaxy clusters whose behavior, it was claimed, was not compatible with any current modified gravity theories. In 2007, astronomer John W. Moffatt proposed a theory of modified gravity (MOG) based on the Nonsymmetric Gravitational Theory (NGT) that accounts for the behavior of colliding galaxies. In another class of theories one attempts to reconcile gravitation with quantum mechanics and obtains corrections to the conventional gravitational interaction. In scalar-tensor theories, scalar fields like the Higgs field couples to the curvature given through the Riemann tensor or its traces. In many of such theories, the scalar field equals the inflaton field, which is needed to explain the inflation of the universe after the Big Bang, as the dominating factor of the quintessence or Dark Energy. Using an approach based on the exact renormalization group, M. Reuter and H. Weyer have shown that Newton's constant and the cosmological constant can be scalar functions on spacetime if one associates renormalization scales to the points of spacetime. ↑ Some Theories Win, Some Lose. NASA. Retrieved November 30, 2007. ↑ David B. Cline, 2003. The Search for Dark Matter. Scientific American. Retrieved November 30, 2007. ↑ Katherine Freese, Brian Fields, David Graff. 2000. Death of Stellar Baryonic Dark Matter Candidates. arXiv:astro-ph/0007444v1. Retrieved November 30, 2007. ↑ Katherine Freese, Brian D. Field, David S. Graff. 2000. Death of Stellar Baryonic Dark Matter. arXiv:astro-ph/0002058v1. Retrieved November 30, 2007. ↑ F. Zwicky. 1933. Die Rotverschiebung von extragalaktischen Nebeln. Helvetica Physica Acta. 6:110—127. Retrieved November 30, 2007. ↑ Zwicky. 1937. On the Masses of Nebulae and of Clusters of Nebulae. Astrophysical Journal 86: 217. Retrieved November 30, 2007. ↑ Dark Matter. UT Astrophysics. Retrieved November 30, 2007. ↑ Douglas Clowe, et al. A direct empirical proof of the existence of dark matter. Arxiv. Retrieved November 30, 2007. ↑ Kelen Tuttle Dark Matter Observed. Stanford Linear Accelerator Center. SLAC Today. Retrieved November 30, 2007. ↑ Direct constraints on the dark matter self-interaction cross-section from the merging galaxy cluster 1E 0657-56. arXiv.org. Retrieved November 30, 2007. ↑ Home Page. American Astronomical Society. Retrieved November 30, 2007. ↑ Stuart Clark Astronomers claim first 'dark galaxy' find. February 23, 2005, New Scientist. Retrieved November 30, 2007. ↑ Abell 2029: Hot News for Cold Dark Matter. Chandra X-ray Observatory collaboration. Retrieved November 30, 2007. ↑ NASANASA Finds Direct Proof of Dark Matter. NASA News Release, at the Chandra X-ray Observatory. Retrieved November 30, 2007. ↑ S. Badiei, and L. Holmlid. 2002. Mon. Not. R. Astron. Soc. 333: 360–364. ↑ Joseph Silk. 1989. The Big Bang. (New York, NY: W.H. Freeman. ISBN 071671812X. ↑ Masayuki Umemura, and Satoru Ikeuchi. 1985. Formation of Subgalactic Objects within Two-Component Dark Matter. Astrophysical Journal. 299: 583—592. Retrieved November 30, 2007. ↑ N. Vittorio, and J. Silk. 1984. Fine-scale anisotropy of the cosmic microwave background in a universe dominated by cold dark matter. Astrophysical Journal, Part 2 - Letters to the Editor. 285: L39—L43. ↑ M. Davis, G. Efstathiou, C.S. Frenk, S.D.M. White. 1985. The evolution of large-scale structure in a universe dominated by cold dark matter. Astrophysical Journal. 292: 371—394. ↑ Jonathan Amos. 2006. Dark matter comes out of the cold. BBC News. Retrieved November 30, 2007. ↑ Ker Than Scientists Say Dark Matter Doesn't Exist. Space.com. Retrieved November 30, 2007. Nicolson, Iain. 2007. Dark Side of the Universe: Dark Matter, Dark Energy, and the Fate of the Cosmos. Baltimore, MD: John Hopkins University Press. ISBN 9780801885921. Freeman, Ken and Geoff McNamara. 2006. In Search of Dark Matter. New York, NY: Springer. ISBN 0387276165. Ginzburg, Vladimir. 2007. Prime Elements Of Ordinary Matter, Dark Matter & Dark Energy - Beyond Standard Model & String Theory. Boca Raton, FL: Universal Publishers. ISBN 1581129467. Radio Telescopes Could Make Dark Matter Visible. Plait, Phil. Found: Most of the Universe. White, Martin. Hot Dark Matter. Mayet, Frédéric. Dark Matter Portal. Bertone, G., D. Hooper and J. Silk. "Particle Dark Matter: Evidence, Candidates and Constraints". Sumner, Timothy J. "Experimental Searches for Dark Matter". "Dark matter comes out of the cold". BBC News. "Astronomers find Starless Galaxy". BBC News. "In the Beginnings". The Economist. 'Missing' Dark Matter Is Really There, Says Hebrew University Cosmologist. NASA Finds Direct Proof of Dark Matter (images). Paper on Direct Proof of Dark Matter. Rincon, Paul. 2006. "Team finds 'proof' of dark matter". BBC online. First direct evidence for dark matter. Carroll, Sean M. Dark Matter Exists. Fritzius, Robert. Cosmology's Missing Mass Problems. A big find in the hunt for elusive dark matter. This page was last modified on 14 November 2017, at 00:11.